If you have any questions, or would like to learn more about us, please feel free to stop in during any evening class to watch, talk, and even participate if you would like! We are open to the public and welcome everyone to stop by. All students will need to sign a South Carolina Ki-Aikido waiver. Our dues are $55 per month. Checks are made payable to South Carolina Ki Aikido. There is a first time fee of $85 which is broken up as follows: $55 one-time initiation fee and $10 yearly fee to Ki Society International, $20 Yearly dues to Eastern Ki Federation. While a formal training dogi is not required, students are encouraged to wear clothing in which they can move easily. Shorts are not recommended as we perform many exercises on our knees. When purchasing a dogi it should be white (bleached or un-bleached) - we traditionally wear a judo-style dogi for it's durability. Ki-Aikido offers children’s classes to help instill self confidence, positive attitudes, discipline and exercise all while having fun. Classes are designed to teach students principles that will help them in their daily life. Our combination of physical activities and calming technique will assist children to excel in life. In a non-competitive environment students will learn self discipline, calmness in actions, and how to work with other children. As they practice, this will lead to a better understanding of how their actions affect those around them and allows them to learn how to lead others in class, at home or in school. Studying the techniques used in Ki-Aikido will help children capture a positive attitude without even knowing it, then apply it in other areas of their lives. This positive attitude will be developed by respecting themselves and others, concentration, self discipline, and the need to do their best. 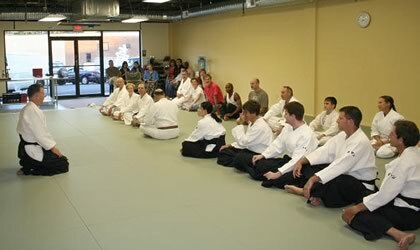 We encourage our parents to be involved and help reinforce the principles taught in the dojo. Parents are encouraged to stay and watch their children to learn how and what is taught, and then help to reinforce these principles at home, this involvement helps increase the impact of training and enforces continuous learning. Communication with the child’s Sensei is recommended to help us understand if a child or parent has any specific needs on or off the mat.